One way to save money on utility bills is to conserve on water! I recently read the book: America's Cheapest Family written by Steve and Annette Economides. They said they put a full 20oz bottle of water in the back of their toilet. It uses less water when you flush to fill the toilet which saves a few dollars each month on their water bill. Try to shower every other day instead of every day. Not only will it be good for your water bill but it will be good for your hair! When you do shower, use a low-flow shower head. It reduces the flow as much as 40 percent. When giving your children baths, don't fill the tub completely. Don't run the water while brushing your teeth. If you shut it off while brushing, you save about 3 gallons in the two minutes it took you to brush. Hopefully you brush your teeth twice a day every day. By shutting the water off, you save an average of 180 gallons per month, per person. Don't wash Laundry unless it is really dirty. I don't know how many times my daughter has taken clothes out of her dresser and I wash them, even though they were never worn! Save enough dirty laundry to do a full large load instead of doing a few small loads. 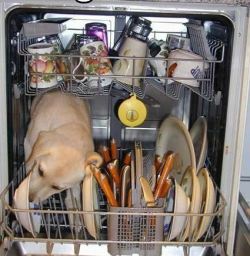 Run your dishwasher only when it is completely full. Use cold water when cooking. Not only will it save money by not using hot water, it will be better for you. I'm not sure if you have ever seen the inside of a used hot water heater lately. They are pretty gross...nothing I would want to eat or cook my food with. Don't use running water to defrost food. Try and remember to take them out of the freezer the night before. Repair dripping faucets. A slow steady drip wastes about 330 gallons per month. When it's hot out fill a pool rather then have your children run in a sprinkler. A half an hour of fun could lead to several hundreds of gallons wasted. Insulate hot water pipes and hot water heater. When you go out of town shut off the water.